During the Early and Middle Miocene eras, dating between twenty and ten million years ago, Africa had a much higher annual rainfall level than today. A single super-rainforest covered most of the continent from shore to shore. 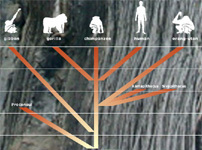 A hominoid (primate) ancestor common to all living apes and humans lived in the trees of this super-rainforest. Africa first became connected to Eurasia around 18 million years ago, causing major geological upheavals, and transforming formerly flat landscapes by pushing up some of the world's youngest mountain ranges: the Pyrenees, the Alps, and the Zagros mountains, as well as the mountains and rift valleys of East Africa. Geographical transformations were accompanied by gradual climatic and environmental changes which may even have triggered the emergence of the first specialised hominoids. The very earliest known representatives of the hominoids have been found only in Africa and were very different from living apes and humans. The oldest finds belong to a group of species in the genus Proconsul. Fossils of Proconsul have been found in Early Miocene deposits 22 million years old in Kenya, and along the rift valley, although it probably originated rather earlier, between 25 and 28 million years ago. Proconsul's skeletons are described as generalised in that it shows none of the particular features such as thickened tooth enamel or adaptation for knuckle-walking which characterised the later apes. It was adapted to living in trees and was about the size of a gibbon. Proconsul suffered somewhat during Africa's collision with Eurasia. Volcanic activity reached a peak 18 million years ago, especially in East Africa. The Kisingiri volcano erupted, apparently with a pyroclastic flow, killing whole populations of Proconsul which lived in an environment that was semi-arid, covered mostly in dry, deciduous, single-canopy woodland, with some evergreen forest in restricted, low-lying areas. Despite repeated volcanic activity around this period, the species persisted into the Middle Miocene (15 to 10 million years) when it overlapped with Kenyapithecus. Another early hominoid also existed in Africa around 20 million years ago. Ugandapithecus major is known to have lived around the site of a now-extinct volcano in Uganda's remote north-east Karamoja region. Scientists say preliminary analysis of a single specimen discovered there showed that the tree-climbing herbivore was roughly ten years old when it died. The skull was about the same size as that of a chimp, but its brain was smaller. Ugandapithecus major was previously classified as Proconsul major, and some areas of academia continue to argue against the reclassification. At about 17.1 million years, probably as soon as a land bridge was formed between Africa and Eurasia, some hominids migrated out of Africa. Once in Eurasia, they eventually found a fertile valley in what is now south-western Germany, north of the Alps, the Engelswies hominid being perhaps one of the very first Eurasian hominoids to appear. The partial upper third molar of the Engelswies example has been tentatively attributed to Griphopithecus. The region apparently had its own microclimate with a mean temperature of 20ºC, about 11ºC above present day conditions there. There was a swamp to the south of a lake which was full of reed beds, with a coastline of deciduous trees, palm trees (amongst them the climbing rattan palms), lianas, ferns and grasses. To the north was a slope covered by an evergreen forest. These Engelswies hominids eventually died out as conditions dried and cooled, but they were the first in a series of migrations out of Africa. The appearance of Kenyapithecus between 15 to 11 million years ago marked the point at which some specialisations began to appear. This hominoid also lived exclusively in the rainforests of Africa's Rift Valley, and showed modifications in the teeth and limb bones, making them more like those of the living great apes. It may have been a knuckle-walker, showing a stage of progression from tree-living to upright walking. Kenyapithecus africanus can be regarded as being part of the combined great ape and human group but cannot be linked directly to any one of the living hominoids. However, evidence has emerged which strongly suggests that Kenyapithecus is not one genus but two. Kenyapithecus wickeri appears to have migrated out of Africa at the same time as many other species and lain the roots of the later European apes. 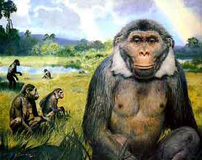 Kenyapithecus africanus has been rechristened by some scholars as Equatorius africanus, because the Equator is where all its remains have been discovered. Louis Leakey was the first, in 1961, at Fort Ternan in Kenya. By around 14 million years ago there were other hominoid variations in existence, and these had migrated out of Africa, with some representatives spreading east across into the Asian continent. By 14 to 11 million years ago Ramapithecus and Sivapithecus were in Anatolia and Pakistan (and had reached South Asia by 8 million years ago where a group of one of them evolved into the enormous Gigantopithecus). They are closely related to the orang-utan, and differed from each other only in size, suggesting that they were also closely related to each other and may perhaps be males and females of the same species. Both also share some of the characteristics of Kenyapithecus, as well as particular features which show they must be related exclusively to the orang-utan and not to humans. This evidence supports the view that the orang-utan was the first to split away from the general hominoid pool in Africa. Dryopithecus emerged in Africa and Europe at around the same time as Ramapithecus, and persisted in Central and North-Western Europe into the Late Miocene. The connection between the two continents was more direct than it is today (see map, above). 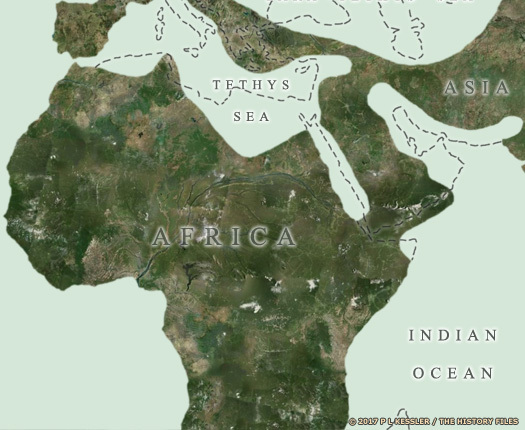 Much of the bulk of southern Europe was still a relatively thin corridor of land no more than twice the width of modern Italy in most places, while the Tethys Sea was twice as big as the Mediterranean Sea which it would later become. Dryopithecus remains have only been discovered in the past forty years or so (as of 2015). The creature, which was more like Proconsul, was thought highly unlikely to be related to any of the living hominoids, while there was a suspicion that it could have a place in early hominid ancestry. Now, though, it seems to have been added into a larger Dryopithecine genus of apes with the link to hominids being discarded. A 13 million year-old infant's skull, discovered in Africa in 2014, came from a new species of ape which may not be far removed from the common ancestor of living apes and humans. The tiny find, about the size of a lemon, was one of the most complete skulls known of any extinct ape that inhabited Africa, Asia, or Europe between 25-5 million years ago. Comparisons with other African ape fossils indicate that the infant's skull belonged to a new species that researchers named Nyanzapithecus alesi. Other species in this genus, previously known from jaws and teeth, date to as early as around 25 million years ago. N alesi's tiny mouth and nose, along with several other facial characteristics, made it look much like small-bodied apes called gibbons. Faces resembling gibbons evolved independently in several extinct monkeys, apes, and their relatives, according to the researchers. The same probably held for N alesi, making it an unlikely direct ancestor of living gibbons. 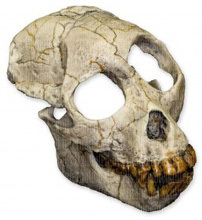 Several of the infant skull's features, including downsized semicircular ear canals, connect it to a poorly understood, 7-8 million year-old ape called Oreopithecus. Fossils of that primate, discovered in Italy, suggest that it walked upright with a slow, shuffling gait. If an evolutionary relationship existed with the older N alesi then the first members of the Oreopithecus genus probably originated in Africa, although that has yet to be proven. Without any lower-body bones for N alesi, it's too early to rule out the possibility that Nyanzapithecus gave rise to modern gibbons and perhaps Oreopithecus as well. 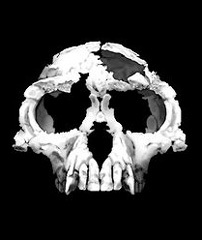 Despite the age and unprecedented completeness of the new ape skull, no reported tooth or skull features clearly place N alesi close to the origins of living apes and humans. At around 10 million years ago a large number of the first ape-like groups had blossomed into a huge radiation of species which reached across Europe and much of Asia. Over subsequent time the majority of them became extinct, mostly due to climate changes and extensive glaciation. Further geological upheavals now occurred. The sub-continent of India had been creeping northwards across the Indian Ocean since about 220 million years ago, during the break-up of the super-continent of Pangea. It finally started to collide with Asia around 50 to 40 million years ago, but the effects of that collision became serious around 10 million years ago. The collision had gradually been forming a crunch point in the form of the Himalayas. Now this mountain rage reached a height which began to impact upon weather patterns, causing them to change. Massively increased rainfall in India (the Monsoon) stripped the air of moisture so that the air currents which reached Africa were no longer wet, but dry. In East Africa this caused drier conditions during the Late Miocene sub-epoch (10 to 5 million years ago). Temperatures began to increase, resulting in a spread of grasslands as the super-rainforest began to die back over the next five million years. Animals had to adapt in response to these changes. Between 7.0 to 5.8 million years ago, hominid transitional species appeared as the ancestors of man and chimpanzee divided. The term 'hominid' refers to the family of primates which includes all species on the 'human' side of the evolutionary tree after that split. The chimpanzee's ancestors remained living in the remnants of the great forests, while early hominids placed an increasing reliance on surviving outside the shrinking forests. 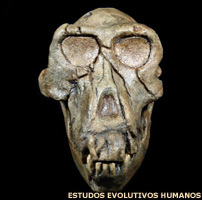 Sahelanthropus tchadensis flourished between 6.7 to 6.3 million years ago. This very recent discovery (in 2001) in the central African state of Chad, in the southern Sahara desert (Brunet et al 2002, Wood 2002), was poised to upset the human family tree. 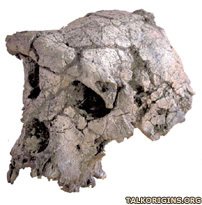 The fossil skull which was unearthed was nicknamed Toumaï. It is as old as any hominid fossil found to date (by 2016), yet its features appear much more human-like than those of other contenders for the title of human ancestor. It was discovered by Ahounta Djimdoumalbaye. Based on faunal studies, it is estimated to be between 6 and 7 million years old, and more likely in the older part of that range. It consists of a mostly-complete cranium with a small brain (between 320 and 380cc), comparable in size to that of a chimpanzee. No bones below the skull have yet been discovered, so it is not known whether Toumaï was bipedal or not. Brunet agrees that it was likely to be a habitual biped because it shares characteristics with other hominids which are certainly known to have been bipedal. Other scientists have pointed out the foramen magnum (the hole through which the spinal cord exits the skull) of Toumaï is positioned towards the back of the skull as in apes, indicating that the skull was held forwards and not balanced on top of an erect body. 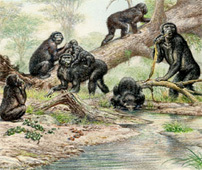 Brunet's camp considers Toumaï to be a hominid - that is, on the human side of the chimpanzee-human divide and therefore more closely related to modern humans than to chimpanzees. This is not at all certain. Some scientists think it probable while others have suggested that it may come from before the point at which hominids separated from chimpanzees (around 7 million years ago). To further muddy the water, Brigitte Senut (one of the discoverers of Orrorin tugenensis) has suggested that it may be an early gorilla. It could have adapted to bipedalism due to the thinning of the vast African forest, caused as the climate dried out, by standing up to reach the most inaccessible fruits at the tops of trees. That would have given it a noticeable advantage over its competitors. It seems to be impossible to know how Toumaï is related to hominids (on the human side of the family tree) until other fossils can be found from the same time period. Whatever it is, all scientists agree with its finders that Toumaï is of major significance, and subsequent discoveries tend to support the view that Toumaï is a hominid. Orrorin tugenensis (otherwise known as Millennium Man thanks to the date of its discovery) appeared between 6.2 and 5.8 million years ago. This species was named in July 2001 from fossils discovered in western Kenya (Senut et al 2001). The fossils include a left femur, pieces of jaw with teeth, isolated upper and lower teeth, arm bones, and a finger bone. Preliminary analyses suggests the hominid was an agile climber and that it walked on two legs when on the ground. 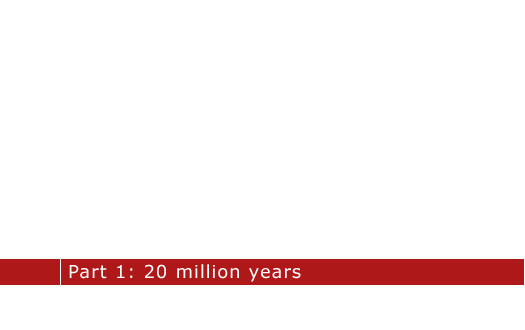 The tentative date of six million years, taken from the age of the deposits in which the fragments were discovered, indicate a date very close to the common ancestor of humans and chimpanzees, although this date may now need to be pushed back (or at least moved back to the earliest point of its window, around 7 million years ago). 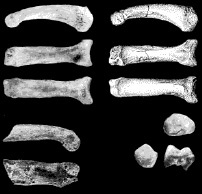 The limb bones are about 1.5 times larger than those of Lucy, suggesting that it was about the size of a female chimpanzee. It probably climbed trees but may also have walked upright on the ground (although for how long is unclear). As no complete skull can yet be formed from the finds, an artist's impression of Orrorin tugenensis is not realistically possible. 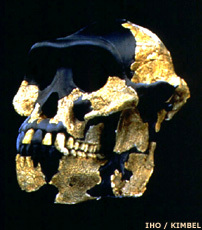 Ardipithecus ramidus proved to be the second longest-surviving hominid species (known to date), flourishing between 5.8 and 4.4 million years ago as the Middle Miocene became the Late Miocene. While Ardipithecus ramidus is not the sought-after 'Missing Link' - the so-far undiscovered creature which lived at the cusp of the evolutionary division between man and chimpanzee - Yohannes Haile-Selassie, a doctoral candidate (in 2005) at the University of California at Berkeley, said the hominid certainly is very close to the branching point. Seventeen Ardipithecus ramidus fossils had been located by the end of 1993 from a cluster of localities to the west of the River Awash, within the Afar Depression in Aramis, Ethiopia. The physical attributes of this hominid show a range of primitive traits, which are most likely character retentions from the last hominid/chimpanzee ancestor. At the same time, some hominid innovations are apparent. The currently known traits of ramidus can in general be placed within two categories: ape-like traits and Australopithecine-like traits. The creature's teeth share more characteristics with all known hominid finds from dates later than this period than they do with the teeth of all fossil and modern apes. The relatively large back teeth and narrow front teeth indicate that ramidus ate less fruit and more soft leaves and fibrous food than his chimpanzee contemporaries, who were specialised frugivores. Vertebral differences also suggest that if ramidus was not bipedal in the modern sense, it at least had key adaptations toward a similar end, almost certainly walking on two legs when on the ground. 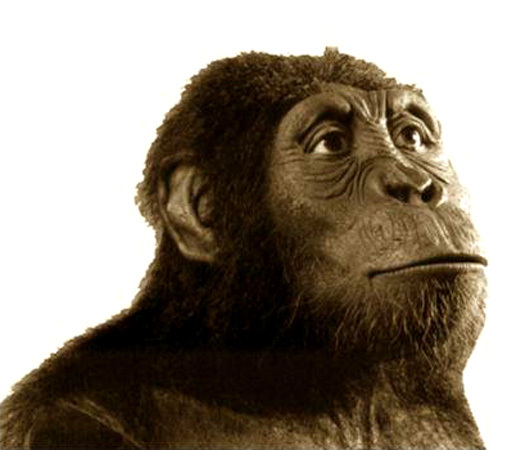 Haile-Selassie believes that ramidus was about the size of a modern-day chimpanzee and about twenty percent larger than the 'Lucy' specimen. Because neither the skull nor intact limb bones of ramidus have been found an artist's impression of the creature was impossible at this time (2005). At the time of its existence, ramidus lived in a forested flood-plain environment - a far cry from Ethiopia's present day environment of harsh desert surroundings. The area in which the hominid dwelled was as much as 1,500 feet higher in elevation than today and it was much cooler and wetter. But the hominid lived at a time at which Africa was in the throes of continental change. The area was peppered with active volcanoes and intense earthquakes related to the formation of the rift valley (caused by the continent's collision with Europe and Asia, and its continued northerly movement). The Awash region then was showered with pulses of thick, hot volcanic ash from nearby volcanoes. 'It's hard to imagine that life would go on under such hostile environmental conditions,' Giday WoldeGabriel, a geologist with the Los Alamos National Laboratory, said. 'Ardipithecus and the other animals inhabiting the region were real survivors.' The researchers found that numerous animals lived during the time of ramidus. The research team found more than 1,900 fossil specimens comprising the remains of more than sixty identified mammal species. The fossils included primitive elephants, horses, rhinos, rats, and monkeys. Researchers found the remains of more than twenty primitive elephants together at one site. 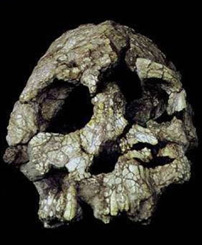 This was the second Ardipithecus species to be found for this period. Ardipithecus ramidus appeared around 5.8 million years ago, while kadabba first cropped up at about 5.77 million years ago. It lasted until about 5.54 million years ago. Ardipithecus kadabba was bipedal - one bone from the large toe has a broad, robust appearance, suggesting its use in bipedal 'push-off'. It was probably similar in body and brain size to a modern chimpanzee. It possessed canines which resemble those of later hominins but which still projected outwards. Only a few post-cranial bones and sets of teeth have been found to date, so information on this species is generally lacking. Discovered in 1997 in the Middle Awash region of Ethiopia, a total of eleven specimens were found for at least five individuals. The fossils included hand and foot bones, partial arm bones, and a clavicle (collarbone). 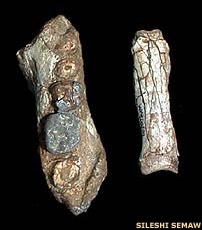 While most are dated to 5.8 to 5.6 million years, one of the specimens, a toe bone, is dated to 5.2 million years. Animal fossils from the site indicated that these early humans lived in a mixture of woodlands and grassland, just like A ramidus. They had plenty of access to water via lakes and springs. In 2002, six teeth were discovered in the Middle Awash at the site known as Asa Koma. The dental wear patterns confirmed that these fossils were unique and not a subspecies of A ramidus. Based on these teeth, palaeoanthropologists Yohannes Haile-Selassie, Gen Suwa, and Tim White allocated the fossils in 2004 to a new species A kadabba ('kadabba' means 'oldest ancestor' in the Afar language). During the Pliocene era (between 5 million and 1.8 million years ago), hominids were walking upright on a permanent basis, allowing them to fully leave behind their former arboreal habitats and survive on the ground in an increasingly treeless environment in Africa. This also freed their hands for important new tasks, such as food-gathering. 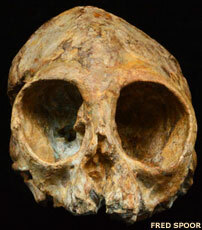 Australopithecus anamensis appeared in Pliocene Africa, surviving until 3.8 million years ago. It was probably descended from Ardipithecus ramidus. First discovered in the Kanapoi region of eastern Lake Turkana, Kenya, in 1965, anamensis comes from 'anam', meaning 'lake' in the local Turkana language. This species was named in August 1995 (Leakey et al 1995). The material discovered at that time consists of nine fossils, mostly found in 1994, from Kanapoi, and twelve fossils, mostly teeth found in 1988, from Allia Bay in Kenya (Leakey et al 1995). A general similarity to other Australopithecus species seems to exist in anamensis. It had a mixture of primitive features in the skull, and advanced features in the body. 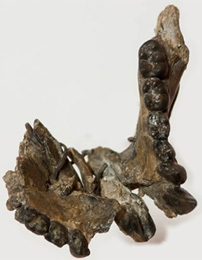 The teeth and jaws are very similar to those of older fossil apes, as is its ape-like crania, although this clearly marks it out as a bipedal hominid. A partial tibia (the larger of the two lower leg bones) is strong evidence of bipedal behaviour, and a lower humerus (the upper arm bone) is extremely humanlike. Note that although the skull and skeletal bones are thought to be from the same species, this is not confirmed. Curiously, the tibia and humerus of anamensis may be more similar to those from members of the genus Homo than they are to Australopithecus afarensis. This has not been decisively shown but, if true, would bring up a very interesting possibility. It may be the case that Homo sapiens is more closely related to this four million year-old hominid than to the widely successful later hominid - afarensis. For the moment this is pure speculation, but it exists as a possibility. Anamensis was superseded around 3.9 years ago by the aforementioned Australopithecus afarensis.